To mark the completion of my world-building work for the Ilevans in The Sword of the Princess, I’ve prepared the following overview of their culture and history for readers. Enjoy! In response to your inquiry on the history, culture, and disposition of the Ilevan Empire, I have scoured the scrolls in the royal library, searching for anything which might be of use to you in your negotiations with the Ambassador Rozma. Unfortunately, I found very little detailing the Ilevan Empire itself. Until little more than a decade ago, in fact, the Ilevans were a distant threat, beyond the borders of Archel and certainly beyond our concern. How the world has changed in my time! But I digress. Your Majesty, the good news is that I was able to find out a good deal about the Zhoron peoples and their history, which I believe will give a good insight into that of the Ilevans since they are, as you know, related. As Your Majesty may or may not remember from the history lessons I gave you so long ago, the Zhoron Empire was an ancient civilization that existed many centuries ago on the vast, hot Southern Continent of our world. Some five hundred years ago, they expanded their territory onto the southern reaches of our continent, which were then peopled by a nomadic group called the Arnan, of whom we know very little for certain. What we do know is that the Zhoron colonists fought extensively with the Arnan and, at length, wiped them out, taking the land for themselves. This land they called “Ileva,” after their word for the north, and it’s colonists became the Ilevans. How these Ilevans came to rule an empire stretching from the southernmost shores of the Southern Continent all the way to our doorstep is difficult to parse out. The histories are incomplete and I confess that before these troubled times we Balnar never had any cause to concern ourselves with such distant affairs. Judging from what I can piece together from various historical treatise, there was, roughly three hundred years ago, a Great War. If the sources from this era can be believed, this war was so calamitous that it brought together kingdoms and peoples from one end of the world to the other to fight in its battles. There are legends, even that the good king Galorndel and his faithful knight Tristan traveled far away to fight in this Great War—a story I am sure Your Majesty will recall. It was one of your favorite tales as a child! In any case, the pertinent point is this: many of the war’s fiercest battles were fought in the Zhoron Empire, on the Southern Continent. Some sources claim these battles were so terrible that in their wake all the land for a hundred miles around was turned to chaos and turmoil. Of this there is some disturbing evidence, for where the most ancient maps show rivers and cities, even the Zhoron Empire’s great capital, maps of the Southern Continent made after this Great War show nothing but barren marshland which no human soul can cross. The effect of this disastrous war was to throw the Zhoron Empire into anarchy and civil war. Claimants to the Imperial throne multiplied, but none had the power to control the vast empire, much less stop its crumbling into ruin. None, that is, save a general who had seized power in Ileva. The Imperial territories of Ileva, being located on our Continent, had not suffered the same horrors in the Great War as the rest of the Zhoron Empire, and so the Ilevan claimant was able to conquer his rivals and rebuild the Empire in his own image. Little is known of this man, but much is speculated, especially by the pagan religion of the Ilevans, which worships him as a god. All we know is that he called himself Arzemheba—which, being interpreted, is He Who Rules—and styled himself as the immortal consort of their pagan war goddess, to whom he owed his victories. Certainly this Arzemheba cannot be the same as the Emperor Arzemheba who sent Ambassador Rozma to us, but in the Ilevan sources I can find no mention of his succession—or of any succession beyond that which formed the Ilevan Empire—and other sources offer only speculation. Some have said the man is a demon who lives on forever in the flesh, others that he is a mortal taking up the mantle of his old predecessor in secret—a charlatan disguising himself as a god—, and others still believe that Arzemheba no longer exists as anything but a figment in the minds of the Ilevans and a figurehead through whom his descendants, Emperor’s Blood, rule. Myself, I favor the second opinion: demons there may be, but I refuse to see them in every place, and as for the Blood, the fact that even are known to tremble at the Emperor’s decrees makes me doubt that the throne is truly their puppet. In all of this speculation, I see no advantage for your current negotiations, except that it would be wise to keep in mind that authority does not rest with the Ambassador here and that deeper machinations may be going on in the Imperial capital than even he can know. For the rest, we know a great deal about Zhoron culture, as it was before the war. The volumes of Marcus the Wanderer originate in that period, and the royal library retains an excellent copy, if I may say so myself. Marcus traveled extensively in the old Zhoron Empire, and wrote much of its people and their habits. I will not bother you with the particulars, but I believe much of what he observed may still be relevant, even to the Ilevans of today, whose habits and even language have changed to adapt to the Eastern-speaking people who inhabit this Continent. First, there is the matter of women. Whereas our culture takes extremely liberal views toward women, even for an Eastern culture, theirs does not. Zhoron culture held women in generally low esteem and they were regarded much as chattel, passed from father to husband with never a say in the matter and never any rights to speak of. Their were exceptions of course, women who managed to be powerful through their influence on their husbands or women who found a place for themselves outside regular society altogether (their female mercenary companies are fascinating, though their devotion to the pagan goddess Inesvi is…unfortunate), but these were rare. If anything, Ilevan views were even more repressive. Their religion restricted the conjugal rights of Zhoron or Zhoron-descended men and women to highly ritual circumstances, but placed no such restriction on relations with foreign women. This the Ilevans took full advantage of, and as a consequence became known even in the Zhoron Empire of old for their lewd behavior and unrestrained depravity toward native women of the land they occupied. From what I’ve gathered from the servant’s observations, there is reason to believe this perverse streak in their natures persists to this day. Some I have even heard say that there are, in the Empire, a class of female slaves, wickedly deprived of their tongues, which the Ilevans preserve solely for their base pleasures—and further that this practice is endorsed and even facilitated by their religion as an acceptable alternative to natural relations between a man and his wife, as God intended them. I would therefore most strongly advise Your Majesty to take all due care to keep Her Highness, Princess Nicole, as far away as possible from the Ambassador and his staff, lest she fall victim to his depredations. Second, there is the matter of family, which I think may have some bearing on the Ambassador in particular. In Zhoron culture, the family was paramount. The family, or House, was made up of several generations living together under a common elder or ma—the oldest man of the House. It was to these Houses, above all else, that the Zhoron peoples were loyal. They marked this loyalty in their very names. Whereas we, as all Eastern peoples, place our Christian name before our family name, they have the reverse: putting their family name before all names—and it is by this name they are most commonly known. I have seen little indication that the Ilevans changed this practice at all, though they may have abolished the use of the old words for it when they made Eastern the official language of the new Empire (the old Zhoron tongue, so far as I can tell, remains as their naming language). The important insight for Your Majesty is this: I have gathered from some of the Ambassador’s guards that the Ambassador’s given name and family name are both alike Rozma (which is itself an auspicious name to them, meaning sun). What this sameness of names means is quite simple, as Houses are most often named for the men who found or lead them: Rozma is a ma, the head of his own House. Possibly his House is a new one, founded by a change of fortunes quite recently. This means he will be ambitious, eager to establish his prestige not only for himself but also for all others in his House and all who may come after him. He may also feel himself beholden to no one, not even the Emperor, in his quest for glory. This can be a great threat, but knowing it can also be a great advantage in negotiations. As they say, Pride goeth before destruction, and an haughty spirit before a fall. Of the Ambassador’s other habits, I can offer something by way of explanation. Zhoron culture lived and died on showing proper deference to those above one in society. Their language contains the most astounding array of honorific forms of address that I have ever seen or heard of. While the Ilevans did away with the language, they most certainly did not do away with the deference. This explains Rozma’s evident disgust at the casual manner of the castle servants and guards toward Your Majesty, and also his outrageous suggestion that you allow him to execute them on the spot. I would take great care in allowing the castle staff to serve him and his men in the future, lest you not be there to restrain him next time. Regarding his complaints about our meals, I can offer little more than explanation. Marcus the Wanderer observed that rice was the chief dish of all the Zhoron peoples and that they supplemented it with a paste made of crushed peppers, which they called leroz. Evidently this trend continues into our present day. Rice of course, is not to be found anywhere in Balanne, nor, I’m afraid, are peppers potent enough for the Ilevan pallet. However, the Zhorons are also said to have enjoyed game, and waterfowl, particularly their entrails. If you could persuade the kitchen staff to prepare such a meal, distasteful as we may find it, it might at least…lessen his incessant complaints. Regarding the curious repetition of numbers in his requests, statements, and routine, Your Majesty’s theories are correct. Pagan numerology has a vice-grip on the imaginations of the Ilevans. Nearly every number, to them is an invocation of their pagan gods. Three, nine, thirteen, and twenty (or re, relore, radozpere, and anla, as you may hear them in the old Zhoron tongue) are particularly highly esteemed numbers to them, especially thirteen, which they hold to represent their entire pantheon in its count. To a lesser extent, 27, 30, 200 and one thousand also fascinate them. Nineteen, or anlajodma, they consider to be as bad a number as can be. To their pagan minds it is the equivalent of Eastern superstitions about thirteen combined with the Christian unease concerning six hundred three-score and six. In their own language it means variously the fatherless man, the lawless man, the man without light, and the man with a missing appendage—they even use it as a nickname for their devil—any one of which it might invoke the attention of or invite as a fate upon oneself. This is why you observed both Rozma and his guards skipping over those particular steps on the stairs: which are the nineteenth from the top and bottom respectively: not even a pagan wants to invite the attentions of Satan or lose his father or a finger or toe! The number fourteen is considered unlucky to a much lesser extent, though great care should be taken in how it is counted in Zhoron. Should you find a man who names it redozperepema rather than the more common gedlorejodma (that is, if you hear them count in their old tongue at all) it is a man to take note of for a potential friend or source of trouble. The use of that form of the Zhoron numeral 14 is associated with those who did not take kindly to Arzemheba’s ascension to the Imperial throne, and still worship their fallen sun god Arazma. Regarding his staff’s reluctance to meet at night, this also is a matter of superstition, and also a telling one. According to Marcus’ writings, the pagan Zhorons imagined Arazma to be both the sun god and patron to the old Zhoron Emperors (who were far less pretentious than their Ilevan replacement). During the night, they believed that his law and order gave way to the chaotic rule of his outcast son, Mochazh (whose name I must warn you never to say in the presence of any of the Ilevans—they are very superstitious about it), whom we would call the Devil. After the Great War, Ilevan mythology took over and wove a new tale, saying Arazma had died and been largely replaced by Arzemheba, who was no longer bound by light or darkness, having defeated Mochazh as well—at least in his boasts—and passed the duty of the sun to some other god. Evidently, however, the pagans could not agree on their own lying legends and while the official position of the pagan priests is that the Devil is defeated and the night made safe, more common folk, especially in the old Zhoron lands of the Southern Continent, still fear the night as much as they all fear the name Mochazh. If the Ambassador fears not the night but his guards do, that may be an important divide in regional and religious background to be conscious of. Regarding his recountings of pagan myth and folklore, and those of his staff, I can only say that I do not believe they mean to offend. Marcus relates that the telling of myths and legends was a common passtime among the Zhoron people. If anything the Ilevan culture is more inclusive religiously than even theirs. However their propensity for attaching our Lord Jesus Christ with their myths is not only blasphemous but…unfortunate, and may lead to further misunderstanding down the road. The figure they refer to and with whom they blasphemously associate our Lord, is the pagan god Arazma, and when Arazma, was supposedly killed by Arzemheba, his worship became a sign of rebellion. Should the Ilevans persist in their blasphemous religious confusion of our Lord with their fallen pagan god, it may create further tensions in the negotiations. Of the rest I can see little of use, so I shall give a few more small pieces of advice before I close. Marcus observed that Zhoron peoples stood very closely when they spoke to those they trusted, and far away from those they disliked or else considered far beneath them in a social sense. That Rozma maintains his distance as he speaks with you may indeed, as Your Majesty suspected, be an ominous sign for the negotiations. His bluntness and his insistence on strict punctuality, however, are not. While Marcus observed that the Zhoron were round about in their politeness, even in his time the Ilevans had a reputation to be more direct. Evidently in the intervening centuries, that directness has come to the fore. As for punctuality, both Zhorons and Ilevans have always prized timeliness as a high virtue. They have even invested great sums of time, energy, and gold creating devises to tell time with great accuracy. According to more recent sources, the Emperor’s compound of Itan in the Imperial city, has as one of its chiefest features a great clock powered by waterwheels, which rings out every hour like a church bell with unfailing accuracy. Therefore,do try to be punctual and direct in your dealings with the Ambassador, Your Majesty. The rest of my findings we may discuss at your leisure. Your work with the Ambassador remains at the forefront of my prayers, as with all of us in the castle. Alright, so I’m a little late in posting this notice, but I have a three-chapter update to the Lit Major Shoots Zombies story. All three chapters follow the same narrative arc. What begins as a simple trip to see if a local fortune-teller can help decipher Chris’ mysterious dreams quickly turns into a hunt for a mysterious entity that’s controlling the ravens around Kingsmouth. Chris and Kaiyo will face danger as never before: and one of them will die! No, honestly, one of them dies—I swear! These chapters were fun to write and flowed naturally into one another for me, even if they did take some time. They allowed me to do some good character development and to cover my favorite quest in The Secret World game so far. “The Ravens” is a quest that, I think, does horror very well. I think Extra Credits would agree (if you haven’t watched any of their videos and you’re interested in games, stories, or even history, you definitely should check them out). “The Ravens” has the player doing fairly mundane tasks most of the time, simply following ravens around the map, but it uses those long stretches to build up tension as the mounting number of ravens signals increasingly to the player that something is not right about these birds. Then you step in to circle of unnaturally-silent ravens, flying all around you, and then…well, I won’t spoil it in case any of you want to read the chapters or play the game for yourself! Suffice it to say that is the only time a video game has made me truly jump out of my chair in fright. The opponent you face is grusome or terrifying (well, unless you count the simple factor of the unknown as terrifying, which it definitely can be! ), or even dangerous by the game’s standards, but the design of the quest works the horror in so well that it doesn’t need to be any of that to be one of the most memorable and frightening monsters a player will face in Kingsmouth. Anyway, check it out if you’d like to see my tribute to such well-done horror, and read up on a dramatic turn in Chris’ adventures. I hope you enjoy! If you like it let me know. The following overview of the Ilevan religion has been prepared as a part of my preparation for the revision of The Sword of the Lady. Enjoy! Alright, listen op ye barbarians! I am Alemarobe, priest to zee god-emperor Arzemheba, and I am here to teach ye abo’t civilized religion. Zee first t’in’ ye probably notice is dat Ilevan religion has lots of gods. Den ye probably ask stopid question like, “Vhy do Ilevans need lots of gods? Ve only have von’ god. How do dey even keep track of dem all?” Zee answer is dat ve is civilized, and not barbarian idiots vho interrupt important religious lessons! Also, not all zee gods are zee same. Dere are some dat are more important den ot’ers, and all of dem have certain roles and positions in pant’eon: just like some people are more important den ot’ers and have different roles in society (zee owner of dis blog-t’in’ has just told mee dat ye actually have dis veird concept of equality among people, as if ye ver all zee same…ye are very strange!). For example, zee god I serve, zee Emperor Arzemheba, is zee most important god. Ye t’ink I am jost exaggeratin’ beca’se I am priest to him, bot dat is not troe! Arzemheba really is zee most important because he is zee ruler of zee gods. He is zee god of order, law, and visdom. He can see everyt’ing at vonce—and he is zee actual Emperor of Ileva, so he is very important! He is ruler over zee Empire here, and over zee gods in deir vorld, vhich is not a physical vorld like dis von’ bot is like anot’er dimension or somet’ing…it is complicated! I cannot expect ye to understand, simple barbarians, since yer brain can barely handle von’ dead god as it is! Dere are two ot’er really important gods, besides Arzemheba. Dere is Inesvi, zee goddess of var, virgins, and revenge. She is zee vife of Arzemheba. Ye probably ask, “Vait, vasn’t her name Enusvi? And how can she be zee goddess of virgins is she is married?” Zee answer to last question is dat ye do not vant to mess vit’ her: she bites down vhere it horts a lot. It is safe for Arzemheba because he has zee iron phallos—bot ye do not, so don’t try it! Zee answer to second question is dat ye are stopid barbarians. Inesvi has alvays been spelled dat vay, and especially has never been spelled vith silly letter “u” dat makes ye sound like a cow vhen ye say it. Zhoron lang’age does not even have dat stopid letter (zee owner of dis blog-t’in’ says dat he spelled it dat vay in his bo’k as some kind of pig-Latin version of Venus, and dat he even wrote Zhoron as Suron, but obvio’sly he vas vrong: it is beca’se he is barbarian as vell!). Anyvay, vhere vas I? Oh, yes! Zee t’ird really important god is Irlomi, zee goddess of zee moon, rivers, vives, and mot’ers. She is zee von’ vho vaters all our lands, or floods dem if she gets upset. Ye may say, “Dat is jost zee irrigation systems and zee rivers,” bot vhat do ye know, ye stopid barbarians? Irlomi is areal and genero’s goddess and sister to Inesvi. She, Inesvi, and Arzemheba make up zee Triad: zee t’ree highest gods in zee vorld. “Vhat about ot’er gods?” ye ask. Finally, an intelligent question! Zee ot’er gods each have deir roles, but dey are not as important. Dere are ten ot’er major gods besides zee Triad. Dere is Lan, zee god of zee forests and of hunts. Den Hati, zee goddess of zee seas and fishing. Den dere is Shangre, zee god of travelers and roads. Den dere is Lebeni, zee goddess of zee hearth and home…she is not very important unless ye are a voman, but she is also goddess of zee sun, so she is important in a vay. Dere is also zee god Gonja, zee god of zee forge and craftsmen. Den dere is Ngeta, zee god of fertility, and Mejni, zee goddess of passion and art. Den ve have zee god Shocha, vho is zee god of harvest and rice, and zee goddess Teji, vho is zee goddess of vine and grapes (zee owner of dis blog vould like me to say dat Teji has an important feast in zee spring vhich is an important part of his bo’k but she vas called Thenaai, but Thenaai is not even a close to a vord in Zhoron, so is stopid bo’k—vho cares?). If ye’ve been countin’, barbarians, and if ye can count, ye notice dat ve is missing von’ god. Dat is zee god Mochazh—bot do not say dat name o’t lo’d! It is very bad lock! Instead ve vill call him by anot’er name, Az-Anlajodma. He is zee god of zee undervorld, darkness, misery, and suffering. “Vhy do ve have such a terrible god?” ye ask. Now ye is back to zee stopid questions. Vhy do ye have devil? Is zee same t’ing. Az-Anlajodma is zee bad god, bot if ye give him sacrifices and pray nicely maybe he leave ye alone. Better to pray to Arzemheba, dough, since he beat Az-Anlajodma and killed him…maybe (he is a trickster god, alright? It is hard to tell!). At dis point maybe ye are t’inkin’ dat is all zee gods, but dat is very stopid. Of course dere are lots more gods. Dere are gods for families, regions, phenomenon, and even priests. Technically I am a god—how else vo’ld I know all dis about zee ot’er vorld? Bot dey is not as important. Ye can vorship von’ or two if ye have good reason, like if dey are yer family’s god, but mostly ye jost need zee 13 gods of zee pat’eon. “And how do ye vorship?” Dat is stopid question. If ye need somet’in’, ye pray to zee right gods to give it to ye. If ye need a go’d harvest, ye pray to Shocha, and also Irlomi and maybe Lebeni. Is best if ye pray to an image of zee gods or at a shrine, and is even better if ye give a sacrifice. Ye probably t’ink dat “sacrifice” means dead, burnt animals, but vhy do ye t’ink gods vo’ld vant dat? Nobody vants dat! Leave zee gods somet’in’ nice at zee altar, like food or drink, or clothes or jewelry, den dey vill do somet’ing nice for ye. Dat is how it vorks! Ye only need a blo’d sacrifice if ye have done somet’ing to opset von’ of zee gods, or if ye are trying to get Inesvi’s attention. Inesvi only accepts blo’d sacrifices, because dat is how she is. She vill also take homan sacrifices, mostly on zee battlefield, bot sometimes ye can sacrifice somebody to her beforehand so she von’t kill so many people in zee fighting. Some people say all zee gods accept homan sacrifices, bot dey are wrong. It is jost all priesthood initiations require dying to zee old self, and sometimes zee initiate is not vorthy and so it becomes just dying, period—bot dat is not zee same t’ing! Ve also tell lots of stories abo’t zee gods. Dey are go’d stories, too, better den yer stopid stories abo’t yer boring dead god, anyvay. And dere are lots more of dem, beca’se ve have lots more gods and dey are moch more interesting and do many more t’ings den yer dead god. So, as ye can see, it is a very civilized religion, very go’d von’, too. Ve vill let ye keep yer stopid barbarian religion, so long as ye pay taxes to Arzemheba and obey him! Now go, barbarians! I am done talking to ye! A new chapter of my fanfiction for The Secret World went up last night! In Chapter 9 Templar agent Chris Warden will have to team up with Kaiyo Yako and Dan MacFadden of the rival secret societies to help save the survivors of zombie-ridden Kingsmouth, Maine. In the process, she’ll be forced to face her fear of heights, and a terrifying all-consuming enemy literally from her nightmares! This was a fun chapter to write, but it took a lot longer than I anticipated. I feel like if I wanted to, I probably could have split it into two chapters if I wanted to. That’s something I’ll have to keep in mind on future chapters. The good news is that since being posted at 2am last night, the chapter has already gained 28 views and 2 positive reviews. It seems I made the right choice in deciding to write a sequel for this story first. My only regret, and something my business savvy friends have pointed out, is that I’m not able to make any money off of this work. Hopefully it will pay off in a larger fan-base that can translate to my other works. We’ll see. Regarding those, Sword of the Lady is currently behind schedule as I enter a new round of world-building with it, in hopes of fleshing out the Ilevan’s as a unique people rather than a stereotypical bad guy race. I’ve found some good resources for this and believe I can do it quickly, or at least get it done enough to work the improvements seemlessly into the final draft, which is currently in progress through chapter 1. The original sci-fi referenced in my “Astrea Alexandra” posts is still deep in world-building. Placing it in real, known space has necessitated mapping its star systems using actual stars, and figuring out what’s around all those stars is turning out to be time consuming. It’s on the back burner, but I’m determined that it will someday see the light of day. So, I’m going to try to be using this site more to keep people up to date in what I’m doing writing-wise. To that end, an update! Lit Major Shoots Lighting was my original fan fiction story writen for The Secret World MMORPG and it was honestly something of an experiment. The game itself is a unique blend of horror, action, myth, magic, and conspiracy theories in a modern day setting, and when writing the story I wanted to increase the immerse qualities of the game. So I chose an unusual tense and point of view for the story: 1st person, present tense. In many ways, it was a rewrite of my “The Secret Letters” short story. I also honestly cut some corners in character development and by injecting myself and my reactions into the protagonist wherever something I hadn’t established wouldn’t conflict with them (the protagonist is female, so there are obviously some differences). The story revolves around an ordinary English literature major, Christen “Chris” Warden, studying abroad in London who suddenly develops supernatural powers she cannot control and is contacted by the secret society of the modern-day Templars who offer to teach her to harness her powers if she joins their cause. Despite my cutting corners with the planning, strangely enough, the main character is one everyone seems to love and says is well developed. Lit Major Shoots Lightning also been my most popular story so far, garnering nearly 3,000 views and enthusiastic fans eager for a sequel. Well, those fans have been heard! In September I started the sequel, Lit Major Shoots Zombies, wherein Chris makes good on her promise to help the Templars fight monsters and is deployed on her first mission, to the sleepy little town of Kingsmouth, Maine that’s been overtaken by a local zombie apocalypse. It’s been a while since my last update, but chapter 8 just went up this Thursday, just in time for Halloween. In it Chris strikes out on her own into the zombie-infested town, looking for supplies for the survivors holed up in the Sheriff’s Office at the edge of town. It won’t be the first time she’s fought zombies in this story, but it will be her first time facing them down alone. If it sounds interesting to you, give it a read and let me know what you think! Reviews and comments are always appreciated. Well, as of 6:27 this morning, I am a published author. My original science fiction novella Future History went live on the Kindle ebook store for $2.99. It is a small step, but an important one. It will definitely help me gauge the self-publishing waters and figure out how to proceed with further stories (such as Sword of the Princess, which is still in open beta), as well as beginning to supplement my income. Future History is a Christian space-opera. It follows the life of starship engineer Amelia Hanson. In a distant future where mankind is fighting a desperate war against the Algolans–a malevolent alien race–, Amelia becomes a war hero, saving the lives of her comrades aboard the starcruiser Mizar with a final act of desperation and genius. The cloaking device she improvises could be the key to winning the war and saving millions of lives, but unfortunately the secrets of its design die with her. Five years earlier, Amelia is serving as a junior maintenance officer aboard the Terran transport Capella when her life is suddenly interrupted by memories from her future as a war hero. As the story alternates between the future and the past, it becomes clear that the Amelia of the past holds the key to saving our future. While the story is, in many ways, an obvious homage to Star Trek, it contains original elements. One particularly unique feature is the way the story shifts back and forth from the future to the “present.” This is made even more unique by the fact that the “future” segments are presented in reverse chronological order, meaning that each adds a little more detail than the last, bringing the two storylines closer until eventually they merge and catapult the protagonist and her friends into action. The story is about 29,000 words and is divided into 12 chapters (called “sequences” which are further subdivided for a total of 18 short chapters). Future History was one of the later products of my high school writing career. I conceived it as a series of short scenes showing a character’s progression through field promotions in a Star Trek-esque universe, and eventually hit on the idea of using the creative flow of time through the story to make it interesting. I originally believed it would be a short story that would take me about a week to write. It took me about a month and ended up being my second completed manuscript-length piece. After writing it, I conceived of and started drafts for two possible sequels, but never completed them. I feel that the lack of a time-travel plot would have subtracted from them anyway, though I may return to them if Future History generates enough interest to warrant it. In any case, after Future History was completed in 2007, it sat around collecting dust on my hard drive (which is possible). I did not feel that it was my strongest story, and I knew that getting a novella published would be much harder than attempting to publish my short stories (which were themselves proving to be too long for the publishers I sent them to). Now that I have some experience with non-profit self-publishing of fan fiction and have plans to introduce the start of my fantasy series, I thought it was time to test the waters by self-publishing on Amazon. I considered a number of my past stories, works which I felt were the best they could be, even if they are not quite what I would write today. I almost rejected Future History because it’s softer approach to science fiction (in Mohs Scale of SciFi Hardness, it’s a solid 2), but after considering that my dislike of the story may be colored by my resent attempts to make a much harder dystopian scifi, I gave it a second look. After very light editing and some review of my self-publishing reference book, I loaded it up on Amazon and released it into the wild to see how it would fare. I also created my own cover. The artwork is original, by me, depicting Amelia in the foreground with an Algolan starcruiser laying into the Capella in the background. I confess to having very little idea of what any of this should look like when I got started. In the seven years since I finished the story, I completely forgot what I wanted anything to look like, though I remembered making sketches of a boxy Capella and wedge-shaped Mizar at one point. I mostly went about looking up hints to the appearance of things in the story and expanded on them, making sure to concentrate on the three elements I knew needed to be in the cover: the protagonist’s face (covers with faces sell better and generate more interest) and a space battle. I think the result turned out rather well. With the release of Future History comes other changes. As a published author, I will need a site. For now, Starship Dragon will do, but I’ll need to expand it to accommodate my original works as well as my fan fictions. Speaking of which, my current Star Trek Online story, Survivors of Yamatai, is now updating weekly on Mondays, which has allowed me to manage my writing life much better and will hopefully lead to me being able to pursue other projects while that story continues to completion. Well, I previously posted about re-imagining the universe for Astrea Alexandra, my original dystopian science fiction. Since that post, I’ve been busy crunching numbers with the help of the excellent Atomic Rockets resource for hard science fiction. While I would not classify my story as “hard” science fiction (I use reactionless drives based on artificial gravity, which is nonsense by definition; I’m actually aiming for a 4 or 3.5 on Mohs Scale of Science Fiction Hardness), the site still has a lot of useful information. So I crunched the numbers for the sort of warships and technologies I mentioned in my previous post. Even with the idea that certain types of circular particle accelerators cause artificial gravity and that antimatter can be contained in quantities large enough to be useful, I expected to come across some problems that I would just have to invent other kinds of nonsense to surmount. For instance, while I was using nuclear reaction-based thrusters as the primary in-universe propulsion, I had to overlook the fact that calculations showed my ships would require several times their own mass in hydrogen to run at full burn for a second. I was basically trying out all the realistic equations so I would know where I needed to plug in additional applied phlebotinum to keep the plausibility of the universe I was building intact, to keep things working as easily as I wanted them to. But, as it turns out, I actually need to concern myself with the opposite problem! Having crunched the numbers, I see that I’ve made space perhaps too easy. For instance, I wanted my 1 kilometer long antimatter-missile-slinging battleships to be able to slug it out with their opposites for hours at a time. Given rough estimates of the effectiveness of point-defenses and their shield strengths, this came out to about 4 hours, which I thought was a good time, but I worried about whether or not a 1 kilometer battleship would have enough magazine space for sustaining that kind of barrage. I worried about the ammunition problem and was even considering whether or not it would be plausible for munitions ships to reload battleships in combat, like a semi-automatic pistol changing clips. Then, I crunched the numbers for the total volume of the missiles. For anyone who’s curious, those numbers follow. Battleships fire three kinds of missiles: long-range ship-to-ship offensive missiles (Sidewinders), medium-range offensive-defensive missiles with variable payload (Interceptors), and short-range defensive-only missiles (Beads). Like the ships, missiles use “grav drives” to accelerate, so they’re cigar or pill shaped (for the purposes of my calculations I assumed they were cylinders with semi-spherical ends, though I used rectangular prisms for storage volume, as that would be bigger and more accurate). What is the rate of fire at the launcher? What is the maximum sustained rate of fire of a battleship in a classic dorsal-broadside engagement? A battleship engagement could take an hour or more to resolve, over four hours for a full engagement between opposing walls of battle. If a battleship carries enough ammunition for a 6 hour engagement, how many missiles is that? What is the volume and mass of these missiles? Assuming storage requires 2.1 times the space, how large are the magazines? As you can see, there is absolutely no reason why a battleship so designed should need to worry about magazine space. In fact, I wound up going with a larger coefficient for storage (I think it was 4 or something) and giving the battleships 12 hours worth of munitions instead of 6, but the amount of internal volume devoted to magazines is still very small. It comes out to about 1.4% of the internal volume and 3% of the battleship’s mass. Making large portions of the interior and exterior of the ship unusable for magazine space made this more of a limiting factor, but I still don’t think it’s going to make sense for me to write a story where battleships start running out of ammunition, unless they’ve already been in several long battles without opportunity to resupply. Now, frigates on the other hand are about a third the length of a battleship and only have 3.6% of its internal volume to play with. Squeezing a magazine capable of sustaining the frigate through the course of an entire 4 hour engagement would be a challenge (but it can be done, I’ve crunched the numbers), and anything smaller need not apply–battleships will certainly be the queens of space (at least until they meet the 2-kilometer long heavy dreadnoughts, with double their firepower and 8 times the internal volume…then they’re just screwed). But this does bring me to some of the problems I had to address by applying phlebotium to make things in universe harder, so that I could tell the story I wanted, without having the logical implications of my universe running away on me to make the story just plain silly. Reactionless drives are superweapons: “Jon’s Law” of hard scifi states that “Any interesting space drive is a weapon of mass destruction. It only matters how long you want to wait for maximum damage.” In terms of grav drives capable of imparting tens of kilogees of acceleration, that isn’t long at all. At 3 kilometer’s per second a vehicle carries as much kinetic energy as its own mass in TNT, and a “slow” battleship that can only pull 10 kilogees reaches that speed in 3 hundredths of a second–and (assuming a density of 0.2 tons per cubic meter, which is comparable to the realistic figure David Weber was convinced to settle on) a battleship weighs in at over 21 megatons. Of course that’s nothing compared to what happens once you allow these things to build up some steam. Two-kilometer long bulk freighters have to pull speeds of 60 PLS (Percent Light Speed, which is 179,875 kilometers per second) in order to jump through a very short-lived wormhole for FTL travel. At those speeds the freighter is a relativistic weapon carrying the kinetic energy of over 900 Petatons of TNT (3.9×10^27 Joules–assuming the same density as a battleship, which may or may not be realistic). That’s ten percent of the total kinetic energy of Earth’s Moon, ten times the total wattage of the Sun! Hitting a planet with one of those would be beyond a civilization ender–it would obliterate all life on the surface and probably seriously alter the planet’s rotation and orbit…and that’s what a freighter could do simply by failing to brake! To avoid a story where planets got flattened by careless pilots, militaries threw unmanned freighters at one another, or battleships had to worry about being shredded by debris or their own spent missile sabots, I decided to make them impervious to kinetic weapons as long as their shields were up. I had already decided that shields in universe would consist of circulating envelopes of exotic matter that had special properties that allowed it to protect a ship from harmful radiation, temperature, and kinetic impacts and had already decided it should be better at taking kinetic strikes than energy ones, to encourage the use of antimatter warheads. When I ran the figures for the kinetic energy missiles and freighters would have, I decided that, in order to prevent a take-over of ramming attacks and kinetic-kill missiles, I needed to make the shields perfectly negate the energy from kinetic impacts. Since the shields are already made of exotic matter that doesn’t play by our rules to start with, I felt like this was an acceptable break from reality. It also explains why planetary sieges would require actual strategy as opposed to, say, just lobbing an asteroid at somebody from a safe distance (the planetary shield would casually destroy the asteroid and then whoever owned that planet would come looking for you in a battleship). Grav Drives Have No Top Speed: On Earth, your top speed is determined by friction. The faster you go, the more friction you generate and the more energy you need to overcome the force of friction and keep accelerating–and the thicker your skin has to be in order to withstand the friction you’re generating. Go fast enough, and friction has enough energy to set off nuclear fusion in the air in front of you, and then you are having a bad problem (and you will not go to space today). In space, there is no friction, so there are only two traditional speed limits. The first is how much fuel you have to accelerate. The second is how long you have to accelerate. For grav-drive ships, neither presents much of a problem. A grav drive is basically a synchrotron (a circular particle accelerator that runs at relativistic speeds), and a small synchrotron (using the Large Hadron Collider as an example and scaling down) does not take too much power to run. At a few tens of kilogees, it does not take too long to build up to ludicrous speeds either. The only possible limit is the speed of light. However, as I understand it, that top speed works by increasing the relativistic mass of the vehicle (though I could be wrong). As a spacecraft approaches the speed of light, it’s apparent mass increases, meaning that it accelerates more and more slowly under the influence of the same amount of force. While it never quite stops accelerating, its acceleration does slow down to the point that actually reaching or surpassing the speed of light is impossible. But mass is irrelevant when dealing with acceleration due to gravity. Two objects of differing mass exposed to the same gravitational field will accelerate downward at the same rate, since gravitational force increases proportionally to mass. This is why, in-universe concern will be given to conserving shipboard volume rather than mass, because the amount of volume a ship has affects its acceleration (bigger volume=bigger grav drive=larger synchrotron radius=smaller radial acceleration of particles=smaller acceleration of ship) but the actual mass it carries does not (except for reaction-control thrusters, but those aren’t a huge concern). So when the universal speed-limit comes along to increase the relativistic mass of a grav-drive ship and get its acceleration under control nothing happens. The ship just continues to accelerate at a constant rate. It’s relativistic mass could be billions of times greater than its rest mass and it would just keep going because the gravitational force would be billions of times greater as well. I have two ideas for discouraging my reactionless drives from breaking the light-speed barrier (the only thing that’s supposed to travel faster than light in the stories is tachyons, and humans haven’t figured those out yet). The first is to make acceleration uneven, such that something at the center of the artificial gravity bubble feels a small amount of additional forward acceleration and something near the edge feels a small amount less forward acceleration. This would amount to about 0.01% of the overall acceleration, making for a +/-5 gee difference on a drive capable of 50 kilogees (which would still be enough to black out any crewmembers who were in the wrong place at the wrong time–or outright kill them if they weren’t buckled up). At high enough speeds, I’m thinking the relativistic mass of the spaceship’s components would exert too much force on the spaceframe, causing the ship to break up. Of course, I may need to cause this mysterious effect to increase dramatically in severity if I want to keep my ships top speeds in the 70-60 PLS range. Since the behavior of the effect and its existence both have to do with the totally fictional science of artificial gravity, I feel like I can make up a plausible-enough solution. Battleships Have The Internal Volume of a Small Asteroid, Without All That Rock in the Way: The internal volume of a battleship is staggeringly huge, such that even her massive magazines occupy only about 1% of her internal volume. This of course, raises the question of what to do with the rest of that space. Part of the problem was solved using the unevenness of grav drive acceleration from before. I could figure part of that volume being generally unsuitable for humans or acceleration sensitive systems during maneuvers (say as section 20 meters deep into the hull). On a warship, this area would generally be composed of armor, with the necessary gaps for hangers, weapons system, cooling systems and a myriad of other things. That accounts for roughly 20% of the ship’s volume. Figuring power requirements to be roughly twice the amount necessary to sustain environmental artificial gravity (which is 1,000 times more energy intensive than the grav drive itself, which I did not expect) and giving the ship a 90 day cruise time, another 20% of the volume goes to fuel. Then there’s the grav drive itself, which makes roughly 20% of the ship at the core nigh inaccessable. The remaining 40% of the ship’s volume is roughly 43 million cubic meters, which falls comfortably in the range of volumes occupied by Star Destroyer classes from Star Wars. That’s plenty of room for all the other systems, storage, crew quarters, and everything else the ship might need, plus giving it the luxury of some extra space (in this universe, high-ranking officers that command battleships are considered nobility and would expect to be accommodated as such). There is No Range Limitation on Jump Drives: In universe, the only thing capable of traveling faster than the speed of light is a tachyon, which humans can detect and cause as a secondary effect of some of their technologies, but cannot put to any useful purpose (yet). In order to make interstellar travel feasible, I’ve given them the Jump Drive, an artificial-gravity based device that allows a ship to create and navigate a stable-but-transient (existing for 10 or 12 microseconds) wormhole as a shortcut to cross hundreds of light-days of normal space instantly. The problem was putting limits on this thing once I created it. The fact that I’d established that artificial gravity didn’t work too close too natural gravitational fields (otherwise, we’d have discovered it by now, since we have plenty of synchrotrons). gave me a reason for making jumping into or out of an area too close to a planet, moon, or star technically impossible. Handwaving complicated jump calculations into existence (plus the need to “align” the drive to match said calculations) gave me a reason why starships couldn’t just jump whenever they felt like it (which would make for some pretty boring battles: “Whoops, we’re losing, everybody jump out now!”). The fact that synchrotrons in real life need time to spin up gives me another reason to make jumps time-consuming. All of that is very well and good for limiting warships in most situations, but in positing a universe where humans have struck out among the stars using this technology, I came to a very important question: why didn’t they go further? A warship has a good reason never to venture too far from its home port, but exploration or colonization ships would just keep moving out there until they reached the edge of their range. And what was that? The only logical limit I can think of is fuel supply, and allowing the ships to use fusion reactors makes refueling even in unexplored space a matter of stopping by a gas giant and skimming off hydrogen with a magnetic ramscoop or something. As long as you’ve got hydrogen, you’ve got fuel, and as long as you’ve got fuel, you’ve got power, and if power is all you need to keep a synchrotron running, well, then, you can practically jump forever (or at least until your food runs out, but a large colony ship could circumvent that problem by growing their own food). While outright stopping a ship from doing something like this is impossible, I wanted to discourage it, so that most humans would settle down close enough to later require warships to shoot at each other with. So far my best solution is giving jump drives a secondary fuel requirement. Instead of hurtling around electrons, I have them accelerating positrons (antimatter). Since positrons are charged and the other antimatter I’m using doesn’t have to be, I’m saying that we’ve invented some kind of neutral antimatter trap for collecting and containing large amounts of neutrally charged antimatter, but are stuck with lower-volume traps for charged positrons. Throw in the idea that jump drives have to spike at insanely high relativistic speeds in order to cause their temporary hole in spacetime, and a limit comes out. It might just be easier and safer to vent the super-relativistic positrons into space after a jump than try to slow them down and recapture them (in fact, early designs probably would have found the latter impossible, since the synchrotron would already be strained and overheating from accelerating the blasted things in the first place, and would burn out and explode–antimatter being antimatter–if someone tried to use the drive to decellerate the positrons again). I’m not sure what the numbers will be on this, but I know they’ll be somewhat arbitrary. The question will always be “so, they can store 5 jumps worth of positrons in so many traps–why don’t they just put more traps onto their ship and extend it’s range?” However, since extremely long-range interstellar travel isn’t anything the protagonists would be interested in, I hope to keep that question on the fringes, out of sight, out of mind. That’s about it! Thoughts are welcome. You’ll be hearing more about this universe and stories in it as they develop. Thanks for reading! The Sword of the Princess: Open Beta Version Available! While it took much longer than I anticipated, I have finally completed the Open Beta Version of The Sword of the Princess! About the Book: The Sword of the Princess is the story of Nicole, princess of the kingdom of Balanne, who escapes the sudden takeover of the kingdom by the evil Empire of Ileva and must work with a small band of knights to unite the kingdom and lead a revolution–all while avoiding capture or death at the hands of the Imperial occupiers. Along the way, she is helped by a large cast of characters, including her best friend and handmaiden, a lanky young squire, a court jester, and even a figure straight out of Balanne’s legends. This book is the first in a planned epic fantasy series (of which I have the next three books drafted and awaiting rewrites), but is itself light on the fantasy side of things. The book is 293,982 words and 540 pages, which I think is moderate for its genre. The book is divided into 73 chapters with an average length of 7.5 pages or 4,000 words. The book is targeted for a Christian adult or young adult audience, as there are strong Christian themes throughout. About Open Beta: “Open Beta” is a concept borrowed from the programming world, where an unfinished product is released to the general public for final testing and revision. This is something similar. Think of it as a peer review that anyone can participate in. The benefits for me are twofold. First, I get reader feedback before I commit my story to print. Second, I get a lot of really good editing tips. Already my “Closed Beta” release to a few close friends has been immensely helpful with everything from correcting typos to restructuring the plot. What Open Beta Means for You: Of course, Open Beta benefits you as well. As a reader, you get a sneak peek at an upcoming book. You also get to have a roll in shaping it. Finally, as I promised in a previous post, anyone participating in Open Beta will receive a free copy of the final version of the book when it’s released. So, if you’re interested, sign up by sending me a message below! Just make sure to tell me you want to be a part of Open Beta in the comments and include a valid email address so I can send you the book (I will never share your information). I’ll get it to you ASAP! I’ve completed two Star Trek Online stories and posted them to FanFiction.net. Both of them serve as “origins stories” for my main Federation faction characters. “The Best Revenge” introduces Carlin back before she became Carlin Drel (before she was joined). As an Ensign fresh out of Starfleet Academy, Carlin seeks to prove herself worthy of the father who abandoned her and to humiliate him. But when a rescue mission goes horribly wrong, she is must face one of the most dangerous aliens in Starfleet history and decide whether or not her quest for revenge is worth it. The story introduces several characters from or referenced in the story posted here, including Commander Antori Drel, Captain Sokar, Doctor Howard, and the USS Nautilus herself. It also features Ferengi and Species 8472…I’ll leave you to decide for yourself which of them is the “most dangerous alien in Starfleet history!” It’s set in May of 2405, four years before the events of the game. “Airborne” introduces Carlin’s trouble-making friend, Sam Hayashi. 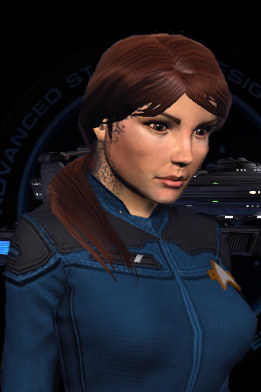 As a young Ensign aboard the USS Endurance, Sam’s mischievous ways threaten to end her career. But when an Orion agent exposes her and her shipmates to a dangerous virus that removes inhibitions, it’s up to Sam to contain the disease and bring them home alive. It’s set in November of 2405. You can tell because of the Stardates used in both stories, and this handy stardate calculator that was used to produce them. Harking back to the Original Series and The Next Generation, this is the cumpulsory first-season “The Naked *something*” episode (one of the earliest episodes of both series was one involving the same inhibition-removing virus, the episodes were called “The Naked Time” and the “The Naked Now” respectively–and, as is the case with this story, no one was actually shown naked). I suppose the writing reason for placing such a story so close to the beginning of a series is to introduce the character as you would normally only get to know them after quite some time, as they let their walls down (by, in essence, forcing their walls down faster), but this story really came to me as an Aesop responding to the modern notion that if one has a desire, one must (or should) act on it. Honestly, once writing took over, I’m not sure the theme got through, but that was how it got started anyway. The only recurring character I plan to take from this story is Sam herself. Her character is an idea that occurred to me well after the writing of the original Vega Colony story. She was actually first conceived as a supporting character for the upcoming Star Trek take on the 2013 Tomb Raider game. In case you can’t figure it out, she’s Sam Nishimura, Lara Croft’s friend and the game’s official keeper of the distress ball. 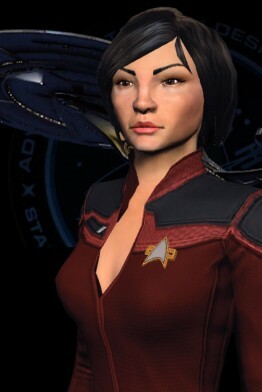 That being said, she is not simply Sam Nishimura in the 25th century. Since my plan was to make Sam more of an action girl in my Star-Trek-remake, Sam Hayashi appropriately has the talents and skills necessary to back up her daredevil attitude. She shoots someone in this story (I won’t say who). She is also an improbably good pilot who has only crashed one shuttle in her life, and that was on purpose (and if you read “Airborne,” you get to see her do it! )–which, considering how many Star Trek episodes revolve around shuttle crashes, that’s pretty amazing all by itself! She owes part of these piloting skills to the other character who proceeded her, an Ensign Satori Hayashi who loved “ancient” (read, 21st century) Japanese culture and was exceptionally good with shuttles. As for the remake, it’s currently in progress. I’m writing the second chapter as we speak, but it looks like it’ll shape up to be a pretty long story, so don’t hold your breath for it to come out. It will be unveiled on FanFiction.net eventually, but you’ll probably suffocate first! Speaking of stories on FanFiction.net, there’s also another author in the Star Trek Online section who writes a “Star Trek Justice” series. He writes stories set in 2412, after most of the events of the game, while I write them set in or before 2409. We’ve officially decided to start writing in a shared universe, allowing our us to reference each others characters from time to time or even do collaborative stories. The first such crossover occurred in the latest chapter of his story “Justice: Vengeance,” where a “Captain Drel” of the “USS Wayfarer” is mentioned–as by 2412 this will be Carlin’s rank, name, and command. Further crossovers should be forthcoming, even involving my non-Federation characters, which I haven’t written anything for yet except backstory. Currently, we plan on making the rewrite of the Vega Colony story a collaborative story, since, in the game, there is a point where experienced players can go back in time to witness further events during the tutorial missions at Vega (the final chapter of the original story hinted at the time-travel). While I’m very excited for all of this fan fiction stuff, I’m not losing sight of my existing projects. The Sword of the Princess beta is still coming along. The chapters should be finished soon, and I may be able to add in my maps. Currently, I can only make a general map of Balanne (the kingdom the story is set in) available to readers, but I have hand-drawn maps for many of the towns, including Bath, Glen, Cleft, Armat, and Malca. If I can get to a scanner in the next few weeks, I can probably make those available to readers as well, which will hopefully help…I mean, I like maps! The third thing I’ve been up to is playing video games and writing fan fiction. I bought the new Tomb Raider and liked it a lot. The game is a relaunch of the franchise’s continuity apparently, and I appreciate Lara Croft’s new background. In the first Tomb Raider movie, she came off (to me) as a spoiled rich woman who became an awesome adventure archaeologist simply because she could. But in the relaunch of the game you don’t even realize that she’s wealthy at all and her becoming an adventure archaeologist is a matter of survival for herself and her friends rather than a decision made out of boredom and being naturally awesome at everything. The result, I think, is a much more believable and relatable character. It also doesn’t hurt that Lara’s bust size has decreased to more believable bounds. My complaints are few and forgivable. The rope arrows are clearly magical as they tie knots and return to your hand (you can fire them without using ammunition). There is a bit of unrealistic first aid in that Lara is impaled in the abdomen by rusty rebar in one of the game’s opening scenes, pulls it out, and doesn’t try to bandage the wound until halfway through the game–but nevertheless is able to jump, climb, wade through nasty water, and fight off hoards of mooks without bleeding out or getting an infection (though, to the designer’s credit, this wound and others do continue to visibly bother her throughout the game). I was also secretly hoping that Lara’s friend, Sam, would turn out to be more of an action girl herself, but instead she get’s stuck with the distress ball, spending the overwhelming majority of the game as a hostage in need of rescue. All of these are forgivable, though, for the sake of the awesome story and gameplay. The only thing that really upset me was the quick-time events in the middle of fights. If you don’t hit the button at exactly the right time, you lose–and I got killed so many times by this one wolf this way: more deaths from that than from any other cause. I’ve also been getting back into Star Trek Online, now that their relaunch of the Klingon faction and new Romulan faction are live. I’ve been writing more fan fiction from that game, too. My latest story stars Carlin, from the former Vega Colony Attack stories posted here. The story is titled “The Best Revenge” and can be found on FanFiction.net, which is a much better place for it, honestly. It deals with Carlin before she was joined to the Drel symbiont, dealing with her father’s abandonment and facing off against Species 8472 for the first time. More stories will follow, including a FanFiction.net relaunch of the Vega Colony Attack story. Planned stories include a Star-Trekked version of the Tomb Raider game (whose basic concept is actually very similar to several plots used by the Original Series of Star Trek) wherein Sam is an action girl, a story introducing a Klingon-faction character (a human-Orion hybrid with angst from never fitting in), and one introducing a Romulan-faction character (a Romulan-Vulcan hybrid ex-Tal Shiar agent forced to survive on a derelict ship for years after the supernova that destroys the Romulan homeworld). “The Secret Letters” will probably also move to FanFiction.net, as there is a category for Secret World fan fiction. Visit my page there if you want to see my latest fan fiction work. I hope you like it and I’m excited to be using fan fiction as a way to introduce myself to the world of online publishing (in a way) and get to know some of the concepts and techniques before launching myself into self-publishing with my completed book.